As US President Barack Obama embarked on his ten day trip to Asia, he focused on job creation and an economic partnership that he believes will help America. On the longest trip outside the US since he took office, Obama announced a ten billion dollar deal that will reportedly bring around 50,000 jobs to the United States. He hopes India will open up to more opportunity for American retailers, granting access the fastest growing middle class in the world. Obama congratulated India on having one of the fastest growing economies in the world. "Together, we can resist the protectionism that stifles growth and innovation. The United States remains – and will continue to remain – one of the most open economies in the world. And by opening markets and reducing barriers to foreign investment, India can realize its full economic potential as well," Obama said from New Delhi. Obama also announced he would remove India from an "entity list" that would allow India to have access to high technology US exports including cutting edge nuclear technology. In the past, the US denied India access to these exports because of a series of nuclear tests that India conducted in 1998. In the past France and Russia have had major high tech partnerships with India. Some believe Obama is recognizing how beneficial these types of deals could be to the US. "We need to forge partnerships in high-tech sectors like defense and civil space. So we've removed Indian organizations from our so-called "entity list". And we'll work to remove – and reform our controls on exports. Both of these steps will ensure that Indian companies seeking high-tech trade and technologies from America are treated the same a our closest allies and partners," Obama said. 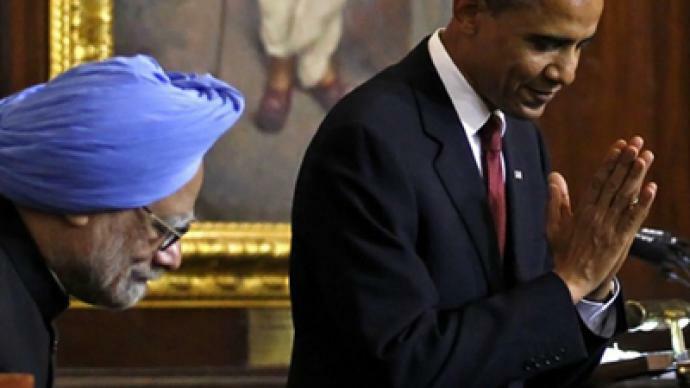 Obama also endorsed granting India a permanent seat on the UN Security Council. He praised India as a strategically important region where the United States has high stakes in both Pakistan and Afghanistan. "Instead of resisting the global economy, you became on of its engines – reforming the licensing raj and unleashing an economic marvel that has lifted tens of millions of people from poverty and created one of the world's largest middle classes," Obama said. In addition to New Delhi, Obama stopped in Mumbai. He skipped a visit to Bangalore, the center of India's IT boom, and Amritsar, the site of the Golden Temple, a pilgrimage spot for Sikhs. Many Indians interpreted these decisions as Obama's attempts to distance himself from appearing to look like a Muslim by covering his head at the Golden Temple, and from being too closely associated with the center of many outsourcing call centers.